We crave the taste and aroma of chocolate and love the physical and mental boost it provides. We also love the recent scientific and media attention regarding chocolate’s health benefits. While there is so much to love about chocolate, we hate the sugar, fat, dairy and guilt that comes with eating it! Chocamine® is a patented cocoa-based ingredient that delivers the best of chocolate—its taste, aroma and health benefits—without the guilt, sugar, fat and dairy. In addition to chocolate, we also have a love/hate relationship with caffeine. We love the instant energy and cognitive boost, but hate the jitters, stomachaches, sleep problems and dependency issues that come with it. The energy from theobromine differs from caffeine. Theobromine, the energizing compound found naturally in cocoa, offers a nourishing energy boost that is more sustained than the crash-and-burn energy from caffeine. Both caffeine and theobromine are xanthine alkaloids, but the similarities end there. Theobromine has a milder stimulant effect, resulting in jitter-free energy. Theobromine has been shown to have less of an effect on sleep than caffeine. Theobromine is less addictive than caffeine, due to differences in adenosine receptor activity. Chocamine® — More Than Just Energy! Capitalize on the health benefits of Chocamine® with our Blueprints for Health® quick-to-market product formulation service! 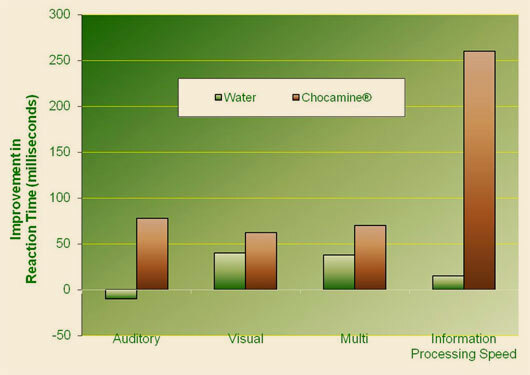 Results: The data from the AVMT studies show that consuming Chocamine® resulted in improved ability to react quickly to alternating auditory and visual commands and improved ability to ignore interfering auditory commands while remaining focused on a visual task. Assessment Tool: IMPACT™ Cognitive Assessment − a prominent neurocognitive research tool used by scientists in the field of neuropsychology, particularly to measure the impact of odor, flavor and the stimulation of other chemical senses. For more information about Chocamine®, download this brochure.